About 30 delegations from countries and international organizations attended yesterday at the Foreign Affairs Ministry the International Workshop on Sustaining capacity-building for nuclear safety and security, organized by the Nuclear Safety Security Group (NSSG) of the Italian G7 Presidency, with the International Atomic Energy Agency and the European Commission. 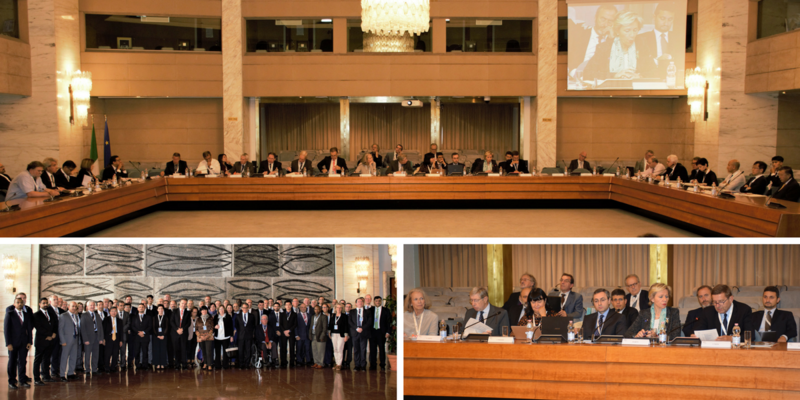 Presidents of the main Italian institutional actors of the sector - ENEA, ISPRA and SOGIN – attended the event as well. The main goal of the workshop was to examine the needs and initiatives in place for the "capacity building", i.e. training, human resource development, knowledge management and networks, which has been analyzed both internationally and regionally through the experiences of Ibero-American and African networks of regulatory institutions and of the emergency management unit of the Gulf Cooperation Council. The specific requirements of the "capacity building" related to the management of radioactive waste and of the decommissioning of nuclear plants have been highlighted by several participants. Some of the topics addressed included the wide spectrum of needs, specific to each country and region, and the time span of at least two to three generations during which skills need to be maintained to ensure the safety of a plant until its decommission. Two roundtables addressed the actions that could help States to develop and maintain the basic expertise to ensure the safe use of nuclear technologies, as well as ways to limit unnecessary duplication in the many international, regional and bilateral programs and initiatives. The General Director for Globalization and Global Issues, Massimo Gaiani, spoke at the opening of the meeting, highlighting the main challenges and opportunities of this sector and the need to promote closer cooperation in the nuclear energy sector..